Crafting Corner is a new feature that I'm hosting that will appear on the blog on the first Saturday of the month and I hope that some of you will join in with me. Crafting Corner is somewhere for us to chat about anything craft related - it can be sewing, painting, drawing, model making, in fact pretty much anything goes. You may want to review crafting books or just talk about any current projects you're working on or things that you'd like to start. I don't really have a set format for these posts so I'm just going to roll with it and see what happens but hopefully some of you will find it interesting and be willing to share what you're working on too. It doesn't matter what day of the month you join in but if you do take part please come leave a link to your post in the comments so that I can check out what you've been creating! I have to admit February has been a bit of a quiet month for me in the crafting stakes, I think I just needed a bit of a break after finishing my huge Frederick the Literate project! I have started something new though and I'm pleased with it so far. I love dragons so this kit is perfect for me, the colouring is beautiful too and I can't wait to get it finished and framed. You can see the finished picture above but the slideshow below shows you my progress throughout the month - I've got a looooooong way to go before it's finished LOL. It's coming along nicely but I'm finding it's taking a lot longer to stitch than usual because every colour has to be mixed with a pearl metallic thread that is a nightmare to stitch with. I've used a metallic thread once before for adding the finishing touches which was bad enough but using it for a whole picture is hard work. 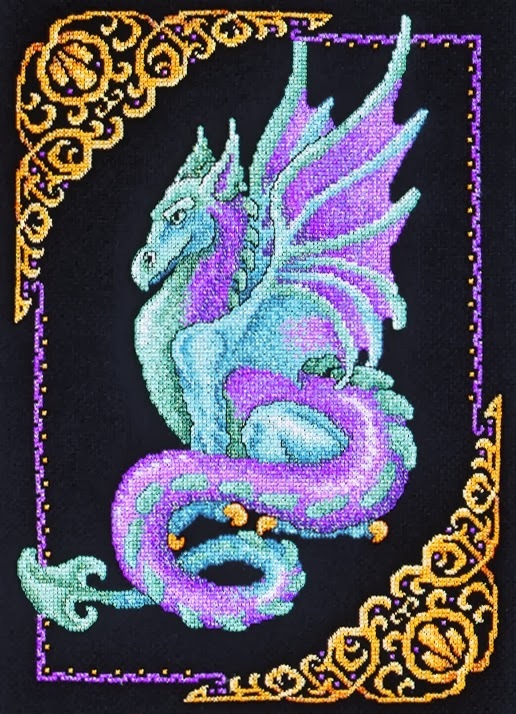 It does create a beautiful effect though and it really makes every stitch look like one of the dragon's scales. I wish I'd managed to show it better in one of the photos but it's very hard to capture on camera. I love these posts, I tend to go through phases of being crafty. At one point it was cross stitch where I made bookmarks or little pictures on squares. Then I went onto knitting where I had to relearn myself how to do it as it had been that long, I knitted a few squares and then gave up. I'm glad you like these posts Michelle :o) I tend to go in phases when it comes to crafts too! I haven't done any knitting for years now but it's something I'd like to pick up again at some point. I also want to learn to crochet, Sammee has created some amazing crochet animals that are so cute and I'd love to figure out how to make them myself. It's just trying to find the time to do all these things that is a problem LOL. Love the dragon! I'm having a bit of a crafting break too - I seem to have my reading mojo back! The dragon is coming along slowly but I think it'll look fantastic when it's done :o) I'm happy to hear you finally have your reading mojo back - I definitely did more reading than crafting in Feb but I'm not complaining LOL. I'm going to check out your post now!